From left to right: Joe Amend, Rick Boucher, Sir Simon Wheat, Nick Avignon, Lisa Marvel, Susan Boucher, Donna Wagle, Laura PIntane, and Ryan Edmonson. Not pictured are Tom Pahnke, and Stephanie Amend. 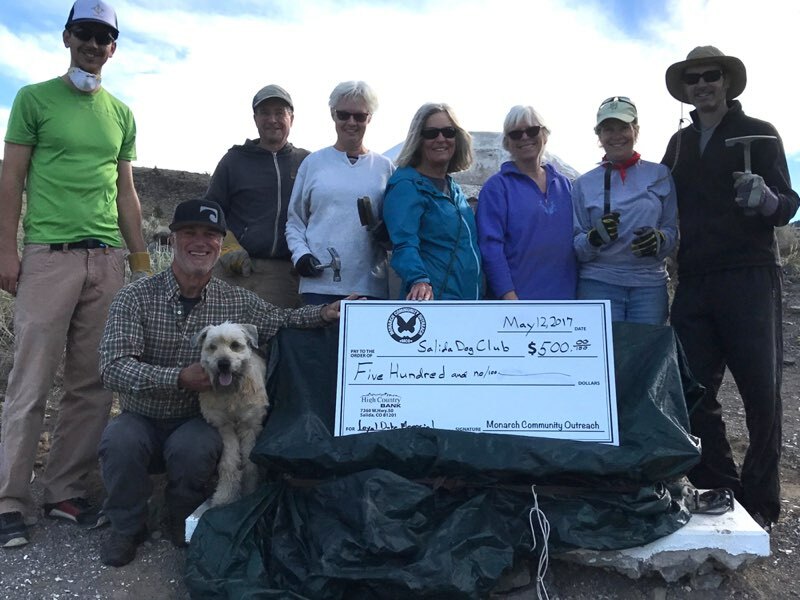 Monarch Community Outreach presented a check for $500.00 to the Salida Dog Club on May 12, 2017. Salida Dog Club requested a donation via MCO’s website. The Board of Directors approved the donation based on the following. The mission and/or purpose of their organization is that they are a group of 9 people that recognized a need and decided to restore the grave site monument of the Loyal Dog Duke Memorial located on Tenderfoot Mountain. The monument has severely deteriorated and is in need of major repair. Without repair this monument may be lost and therefore a part of Salida’s history would be lost with it. The group is Ryan Edmonson, Laura Pintane, Donna Wagle, Nick Avignon, Lisa Marvel, Jon MacManus, Joe and Stephanie Amend and Tom Pahnke. They have received permission from the city of Salida to do this project and a commitment from Hylton Lumber to donate materials for the restoration. They intend to use the funds provided by MCO to purchase new bronze plaques to be put on the monument after restoration is complete. Two plaques will commemorate Duke and provide history of Duke’s life in Salida (1889-1902). The money will benefit the City of Salida. The effort will restore and improve the appearance of Duke’s grave site. It’s a way for the community to preserve the history of a famous dog in Salida. Many people use the trail that passes close to the monument and people often relax on the bench overlooking Salida. Improving this site will make it look good for many years to come. The plaques would describe the significance and history of Duke’s grave site.